I spy...a slew of new wares at the Somafab storefront! We've had a busy month here! 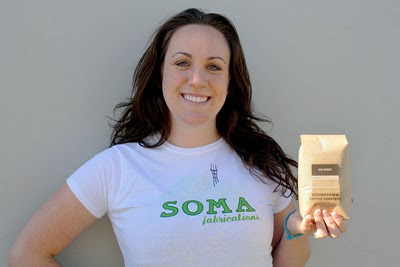 It's pretty exciting, lots of awesome new products in the Soma store... So, seriously, if you're really burnt out at work or just generally playful, I propose a game of "I Spy"..
*Dom(inatrix) Black-inspired by the recent Folsom Street fair, oh snap..
*Mutha of Pearl-I've had this one on my bike for the last few weeks and it's had lots of admirers..it's the belle of the freakin ball. *Gloss Red-this one is mounted on the NEW Soma ZO seatpost. 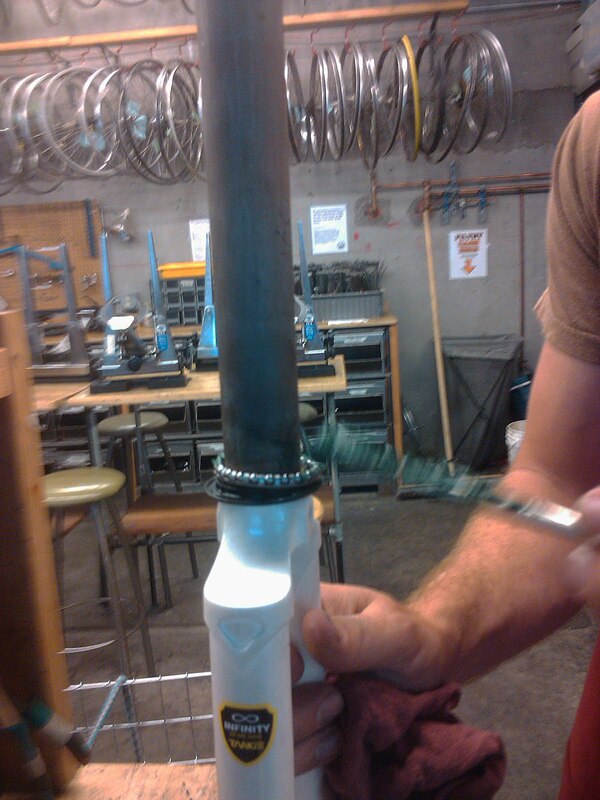 The seatpost also comes in silver and black. 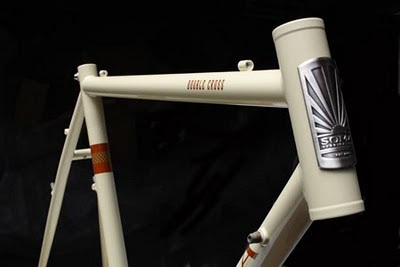 Pake Alloy Track Frameset! Lightweight butted aluminum frame with no goofy shapes matched to a carbon fork that’s raked for track-like handling, but it will still take brakes. Don’t call this one ‘tarck’. It would love some time in the velodrome. Cardiff Leather Bar Tape We've got seamless and seamed. Both awesome of course, no seams means no fraying! Palmy ULocks in Black and White I like these the best of the bunch..
Seatcap Latex Seat Cover Who else is going to protect your leather saddle from Father Winter?! Cardiff Saddles in Moss Green We've got the Mercia saddle (copper rivets) and Cornwall (steel rivets) in Moss Green. And the Cardiff Leather Trouser Strap With reflective area like other trouser straps...but since its leather you could keep it on during your business lunch at the Four Seasons. I think. Thanks for playing, it was fun...and if you don't feel like sorting through the store to find these treasures, don't worry, they're all in the new stuff section.. 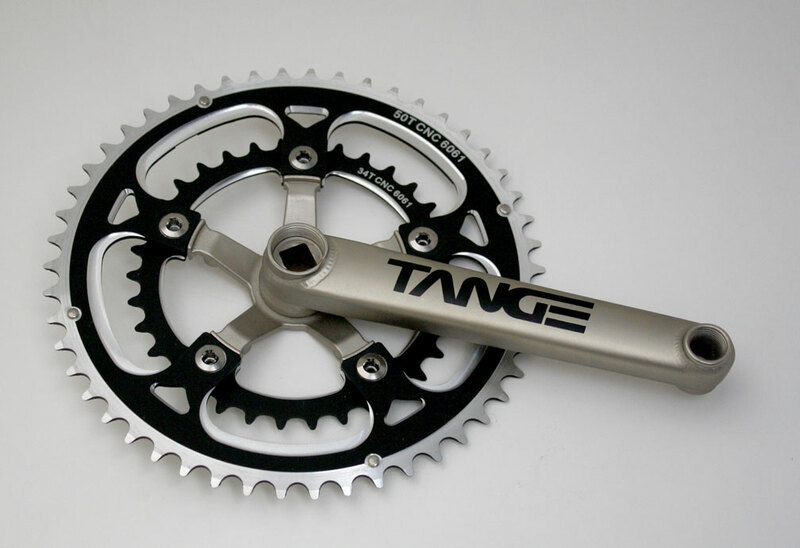 The guys from Tange paid us a visit this weekend after Interbike. Lucky for us, they didn't come empty-handed. 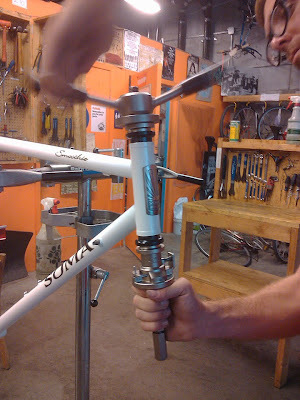 Their bounty included this tubular chromoly crank. It's really stiff AND it's weight is acceptable. Now comes its real test though...what do you guys think of it? The first one is from Bicycling Magazine who just finished reviewing a traditional Double Cross. This is probably the first in-depth review on a Soma frame in this the most widely circulated bike magazine in the U.S., which made one of our dealers exclaimed "about 9 years overdue". We think Michael Frank did a fairly awesome job on this review. The second one is from Mtnbikeriders.com who reviewed a Double Cross DC built with a flat bar set up. It's just a short ride video. RL seems to have no problems keeping up with his buddy on hardtail mountain bike. The in-depth review can be found here. This is my new Smoothie, still nameless, that was birthed this Sunday. Up until then I had been trucking around on a Peugeot mixte (a lovable bike until you're cursing it as you scaling one of SF's hills) . It's not fair to compare these two bicycles but I will say that since Sunday I have been a born-again biker. Let me preface this by saying I'm one of the graphic designers here at Soma. I've been here for 5 months now and before then my bike knowledge was scant. I'm at a conversational level in bike language. I love riding though, and I've started to appreciate the technical aspects of biking more since working here. Smoothie definitely lives up to its name, my neighborhood is rife with potholes but since Sunday, riding's been a whole lot more enjoyable. While my Peugeot (Lucille 2) lagged on hills, climbing with the Smoothie is a breeze (maybe I should name it Ms. Moss). I love it so much that I keep it in my office with my all day-it's too beautiful to be tossed about in the communal bike parking area. 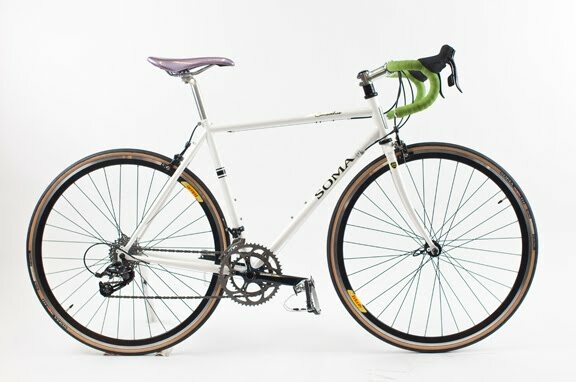 Why did I wait 5 months for biking bliss? 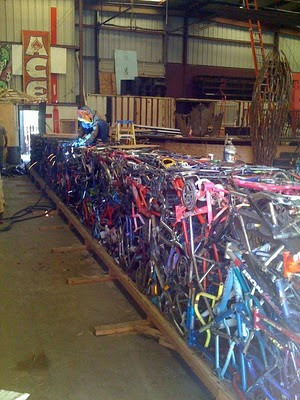 As I mentioned above, having just stepped off the plane in Bike Land, the idea of building a bike was intimidating. I have become more comfortable with the parts, knew what I wanted in a bike and felt I was at the point when I could make a thorough shopping list. I love the Smoothie in Pearl White because of the versatility you have with handlebar tape and saddle color (as I mentioned, I'm a designer). I chose kind of crazy colors, I know, bright colors please me. My coworkers have given me a lot of grief over the tape/saddle combination... there's quite a variety of white Smoothie builds out there-check out our flickr pool. The possibilities are endless! Having never built a bike before but wanting to get a taste of the process, I lured my coworker Keith (the resident mechanic) into helping me (his only currency is beer). 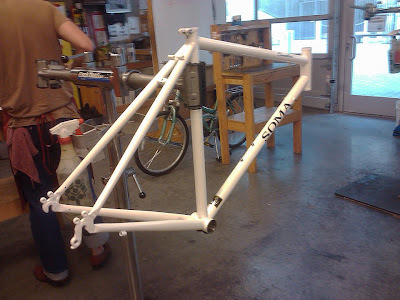 We listened to some Lisa Lisa and Keith built my bike-explaining the process along the way. If you're a novice to building, I definitely recommend having a mechanic help you-it's pretty complicated and involves a few of odd/expensive tools. Yes, building a Soma is intimidating to those unfamiliar with the process (me and many others). Yes, it would have been easier to head down to the local bike shop/shop the interwebs and pick up a Trek or Specialized bike already built. But when you assemble your own, every time you ride it you will be in heaven-relishing every decision you made. And Somas are so much more awesome!! That's all....I promise. Have a great weekend, and for the love of Mike, go test ride a Soma! If you can muster up more energy than that lazy/questionably stoned pug up there is exuding, this weekend San Francisco is abound with cycling related activities. Today is PARK(ing) Day! Yay! Can you think of a better way to spend your Friday evening than cruising around on your bicycle checking out the awesome, crazy parks people have set up (ex. Office Plant Petting Zoo at 2nd and Mission in SF).What an awesome phenomenon. 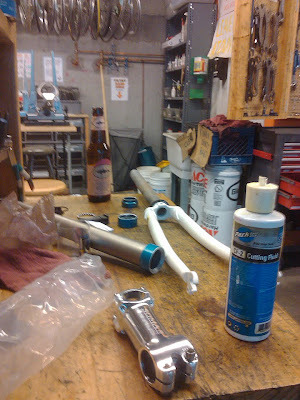 Tonight booze it up at the NorCal CX kickoff party . 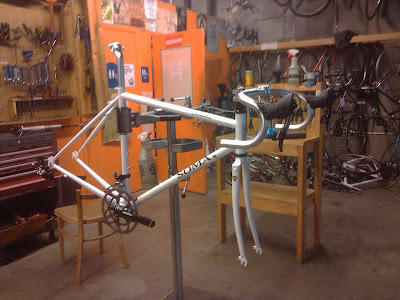 It's at Marin Bike's new locale. 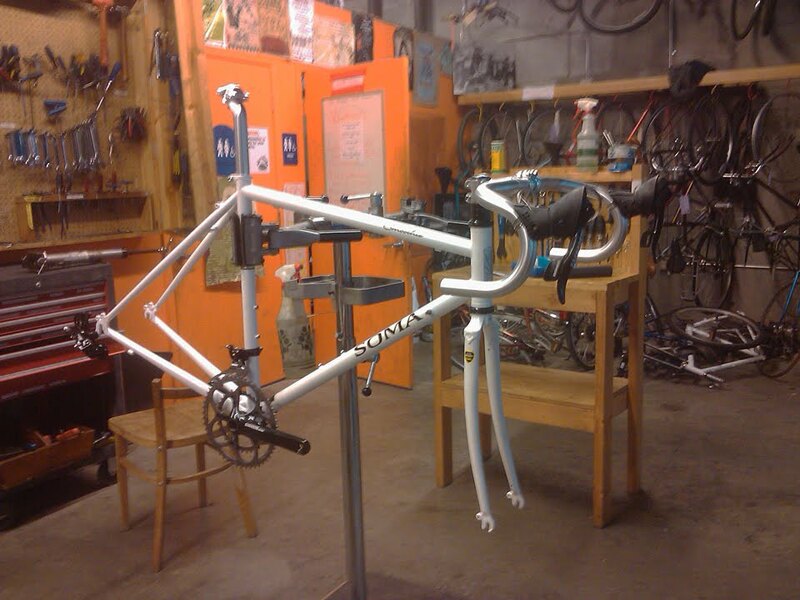 There's gonna be CX-style goldsprints(?!) - which is reason enough to descend on SOMA. Also $15=all you can eat/drink. Sweet. Feel like climbing some crazy hills to see crazy-nice houses? The SFBC is sponsoring a Modern Architecture Hill Climb tour. On Sunday if you've got a 'stache you can join the Mustache Ride to Sausalito. I'm sure a Sharpie 'stache will do if your sans hair 'stache. Little over a week away (Sat. 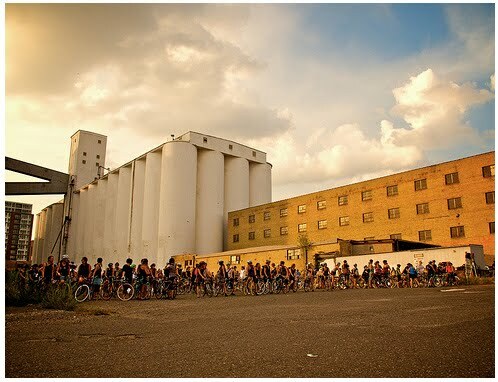 Sept. 18) is the Babes in Bikeland all-female bike race and ride. 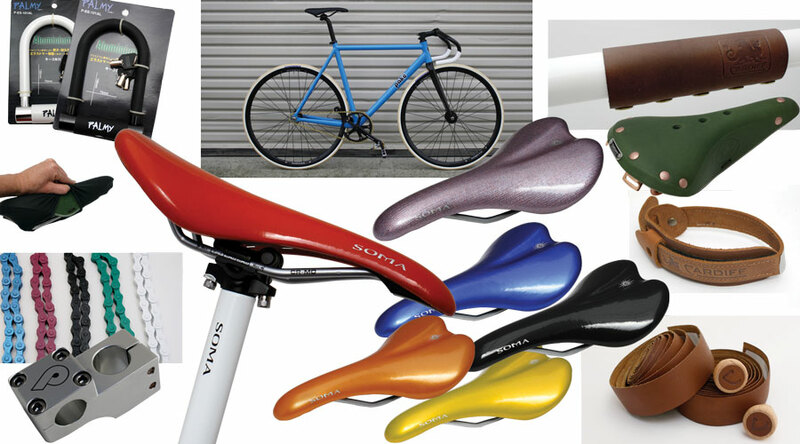 Soma is proud to again throw down some prizes for it. This is the fourth year for this Minneapolis-based event. Last year there were over a 100 participants. Any type of bike is welcome. If you're not the racing type, I am sure they are looking for volunteers to help, too. Speaking of volunteers, our hearts go out to those affected by gas line explosion in San Bruno, the first responders and the local volunteers. Take cares, yo. The City of Santa Rosa in California (home to Levi and Sycip Designs) has installed a 65ft obelisk sculpted from recycled bicycles. The artwork, appropriately named 'Cyclisk', is the talk of the town because it was funded by car company Nissan and has gone up in the heart of the automotive district. “There are some really wide-ranging thoughts on it but I think that's what art is about,” said Christine Culver, executive director of the Sonoma County Bicycle Coalition. 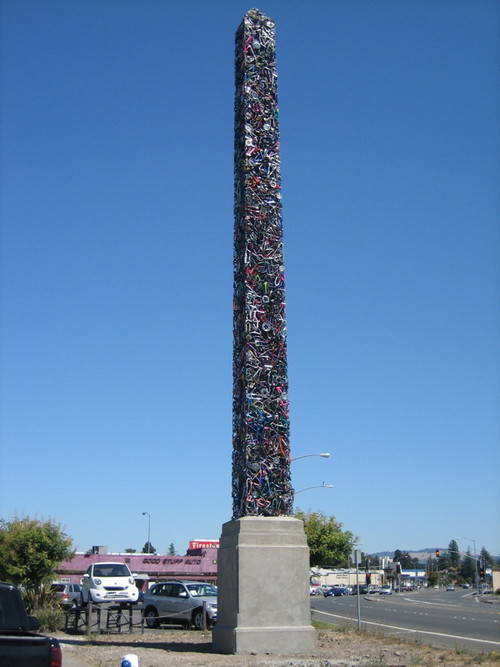 The obelisk was created by Petaluma-based artists Mark Grieve and Ilana Spector, who were commissioned by the city to create a dynamic new piece of artwork for the Santa Rosa corridor. It weighs 10,000lb and is made from roughly 340 recycled bicycles collected from local nonprofit community bike projects. It took nearly four months of welding to manufacture. It might seem odd that the Cyclisk was installed across the street from an auto body shop and towers over a section of town highly populated with car dealerships, but it was no coincidence. The project cost $37,000 and was funded by the one percent tax on a new $3.7 million Nissan dealership building. The “1% for Art” is required by the city for commercial projects that cost more than $500,000 to build. Some community members feel the Cyclisk makes a political statement about alternative transportation while others simply view it as a unique addition to the eclectic array of downtown street art. On the south side of town. US 101 exit toward Baker Ave. (from the south) or Corby Ave./Santa Rosa Ave. (from the north), then turn left onto Santa Rosa Ave. Cyclisk will be a half-mile north, on the left (west) side, just north of the Nissan dealership. Happy three day weekend...hope you all get lots of riding in! If you happen to treat your furry friend(s) to a ride this weekend be sure to take a picture and send it along. Thanks for fueling our office! 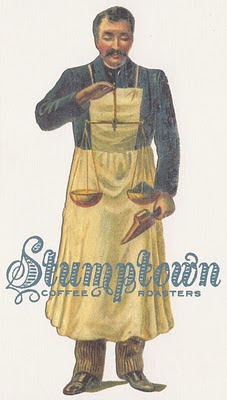 We just received a lovely assortment of Stumptown beans, yesssss! I actually just returned from Portland and there was a Stumptown next door to the hotel I was at. Now I come back and it's in the office.... ahh, life's simple pleasures. Anyhow, coffee and bicycles continue their long and storied romance. Stumptown is the bomb.